“Don’t assume” is an all-round wise rule, but especially in this case. You see, extroverts who are restrained by physical or mental illnesses can often look like introverts instead. They may decline an invite or leave a party early. They may sit by the sidelines or choose not to dance. Whereas once they were spamming your phone or Facebook account with memes or constantly asking ‘what adventure are we going to go on tomorrow?’, now your phone lies eerily silent. Of course it can be less obvious as well. Maybe they were the one always volunteering, offering lifts, running around with their fingers in a thousand different pies – and now they seem to have retreated, or just aren’t as ‘keen’ as they once were to have a coffee. They may ‘need’ more rest than usual or have unpleasant symptoms which draw them away from social contact – but that doesn’t mean they ‘want’ this new life. Our experiences in life really do change us. 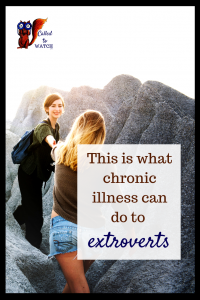 It’s possible for illness to nudge someone from the extroverted side of the spectrum over to the introvert side. I think part of loving someone is not expecting them to always be the same. People change, and when you commit to a relationship, be it romantic or otherwise, you’re in it for the long haul. Will you choose to love your extroverted friend, even if they’ve become your ‘introverted friend’ instead? We also need to try hard not to play the comparison game. ‘You were like that, and now you’re like this,’ never helped anyone. Illness changes the nature of relationships. It’s undeniable. This truth is especially clear when your friend is an extrovert – because extroverts often spend a lot of time doing. They tend to be the friend always organising get-togethers and beach days and BBQs and coffee-meet-ups and reunions. Illness can change this – so one way of loving your extroverted friend may be to find other less-draining ways to hang out. It will take time, and trial and error, but it must be done. If you can’t go out together, maybe you can visit. If they can’t talk much, maybe you can watch a movie. If all else fails, maybe you can simply sit there and be in their presence. Changes take time. Your extroverted friend may feel like they’ve been robbed of all their ‘hobbies’. They may be ridiculously and frustratingly bored. They may feel like their identity – that bubbly, people-loving person they once were – has been ripped away. It’s going to take a while for them to figure out how to express their identity in different ways. To determine how to obtain their energy when going out every day may no longer be an option. They may not know how to communicate these changes to you. Have patience. 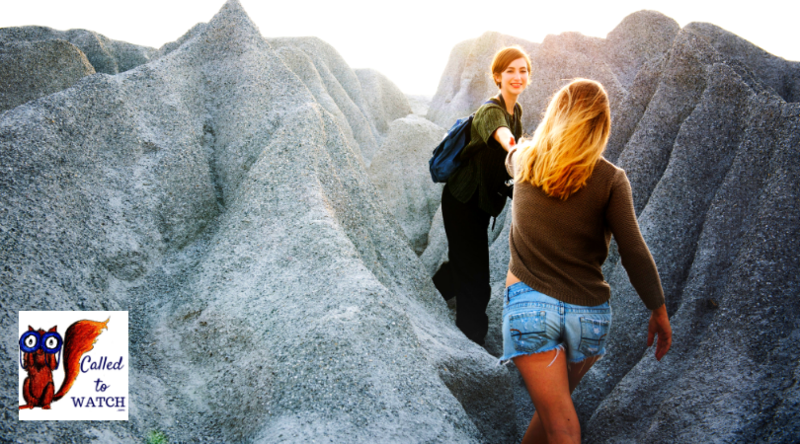 It will take a while for you both to redefine your friendship, but that doesn’t mean you are doing it wrong. Not being an extrovert myself, these are observations I’ve made of extroverted friends and family. It seems to be that extroverts prefer interactive forms of communication. Text message over email, phone calls over letters. Illness of course can change this, but it can be helpful to keep in mind. Frequency also is often important if this is where they are deriving their energy from. Extroverts are often used to attending many social gatherings. It can be difficult when this desire is curtailed by illness, and so the worst thing we can do is assume they can’t/won’t want to come. There are ways to extend invites without social pressure, so let’s never forget to invite them to events. It might look different, but even with the most debilitating diseases it is possible for two people to spend time in each other’s presence. It just takes work. It may mean enduring awkwardness or lowering your expectations of what constitutes ‘hanging out’. Extroverts are generally great talkers. Don’t assume your friend doesn’t want to talk about their illness – they may just be waiting for an invite. Similarly, if they simply won’t stop talking about their illness, don’t shut them down. Often extroverts process things verbally, so be a listening ear. That said, illness is still a difficult thing to talk about. You may need to ask questions: what are their expectations? How can you love them? How much contact do they want? Seek to create an environment where honesty is allowed, so that when the time comes you can talk about these things. Remember, we’re called to love, not be perfect. The friendships I’ve seen flourish are those with individuals who are willing to be available and commit for the long term. There’s a lot of waiting in friendships and a lot of trial and error. Don’t let yourself get frustrated. Deep friendships take years, even decades. Fix your eyes on the best Friend we have, and seek to follow Him in this, as in all things. 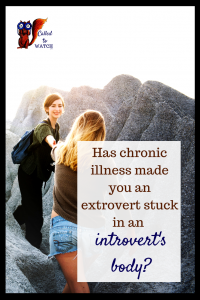 // Is the person you know with a chronic illness an introvert or an extrovert? Has this changed over the course of their illness? I’m also on Facebook, Pinterest, Instagram & Twitter! Meet me there for more interesting reads, resources and community. A wise and thoughtful article. God bless you Emily. Thanks Keith, that means a lot. Loved your definitions of “extraverts” and “introverts”. I’ve been referred as both, at times. Also, thank you for your contribution to the Blogging For God site. God appreciates your faithfulness as we all do!